Sufficient resources exist to accomplish anything. A great river of abundance surrounds us. It has the power to carry us anywhere we imagine. Earth abounds with natural resource and intelligence—everything we need is here. If we multiply and return this abundance, the world becomes more plentiful. Apparent scarcity vanishes and deserts bloom. 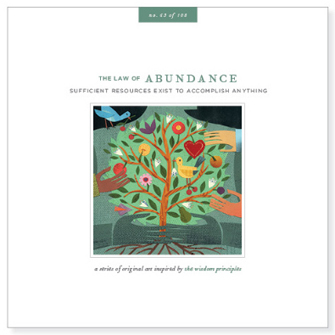 Abundance isn’t something we find. It’s not a destination or an amount. It’s something we create. Each time we choose to live in creative flow, allowing resource to move in and through us, we become abundance.